Tonight we have great news, the red AS2C is completed! You can see the last build update for it here, from now on the project can be found under completed projects. On top of that the pictures for the museum page are also done, you can find them here. 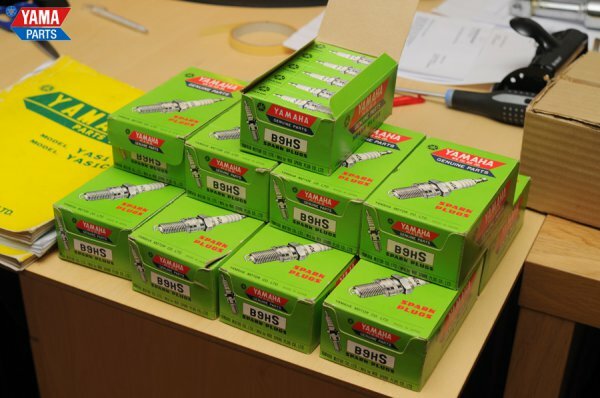 We’ve managed to get a hold of a lot of Yamaha original spark plugs that were used in the AS1, AS2 and AS3 bikes, if you look closely on the picture of the AS2C where you can see the spark plugs you’ll see a pair of them. Our friend Ross in New Zealand has sent us an update on his YL1 project, you can see his progress and the spark plugs in this news update.